This is one of 4 luxury houses situated high above the historic and attractive village of Cromarty. 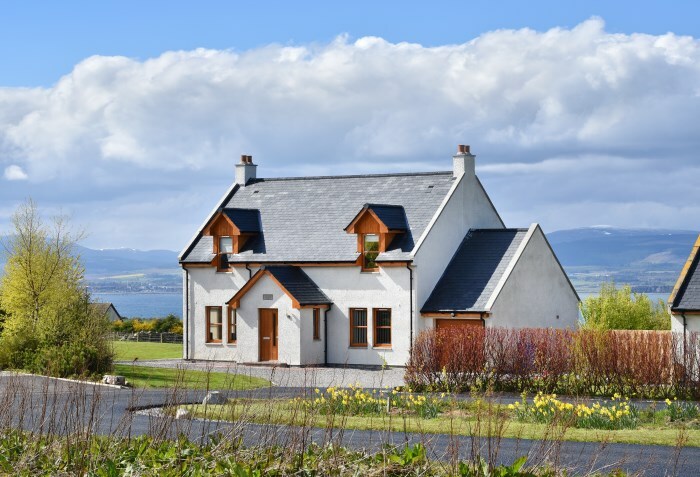 There are truly breathtaking views from the house encompassing almost the whole expanse of the Cromarty Firth, the 3000ft Munro, Ben Wyvis and north to the mountains of Sutherland. Even the occasional oil rigs, which are towed into the firth for repair and service, add their own special effect as they glitter on the dark sea at night and look for all the world like floating Christmas trees! The firth includes two RSPB bird reserves along its shores and from October to March there are literally thousands of overwintering geese and ducks in addition to the resident swans, turnstones, knots and sandpipers. In summer, osprey can be spotted feeding around Newhall Point. Seals frequently make an appearance as do the famous Moray Firth dolphins. Don't miss an informative and exciting trip out to see them with Eco Ventures. Foodies will be glad to know that Cromarty has three excellent eateries; Sutor Creek, with a diverse and imaginative menu, including a wood fired pizza oven; Couper's Creek - delicious paninis, sandwiches and soups plus delicious Orkney Ice Cream and the Royal Hotel - traditional, wholesome and freshly cooked meals served in the bar. Those visitors coming to stay between October and March may well get a spectacular display of the Northern Lights as the house has a northerly aspect with a superb vantage point. Cyclists can have bikes delivered to the house by Black Isle Bicycles, set up for them and adjusted for comfort. Maps and route planning can also be provided. There are endless quiet roads and also some super dedicated mountain biking routes to enjoy. Sandpiper House is perfect for groups of friends or for families throughout the year.